The land for Fort Foster, located on the southwest tip of Gerrish Island in Kittery Point, Maine, was acquired by the federal government in 1872, making this fort the last of the "old" forts that were built in the Portsmouth area. The first fortification, planned in 1873-76, was to be a so-called "Fourth System" 12-gun earthwork and concrete battery known as Battery on Gerrish's Island, or Battery Berry, named after Major General Hiram G. Berry of Maine, killed in action in Virginia in 1862, similar to the work that was begun at Fort Stark. It was never fully completed. The parapet and gun platforms were built, but only two traverse magazines were completed. After minor work was again attempted in 1879, it was abandoned. No trace of it exists today. It was located in the area of where Battery Bohlen was later built. In 1899 construction was started on new concrete batteries to help protect the Naval Shipyard in the aftermath of the Spanish-American War. In 1900 the reservation was officially named Fort Foster, after Civil War era Brevet Major General John G. Foster of New Hampshire, and the post became a sub-post of Fort Constitution. Battery Henry Bohlen was completed in 1902, named in 1904 in honor of Brigadier General Henry Bohlen, killed in action in Virginia in 1862, and consisted of three 10-inch 35-caliber breach-loading rifles, Model 1895, serials 1, 13, 14 (Watervliet Arsenal), on disappearing carriages, Model 1896, serials 69, 70, 65 (Walker Co.). 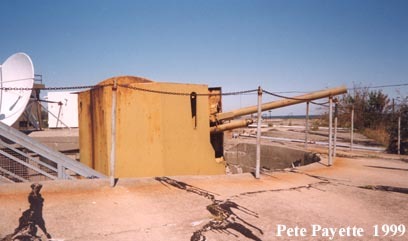 Two Hodges back-delivery projectile hoists were installed to supply the shells up to the guns from the magazines below. located at Fort Casey, Whidbey Island, Washington. 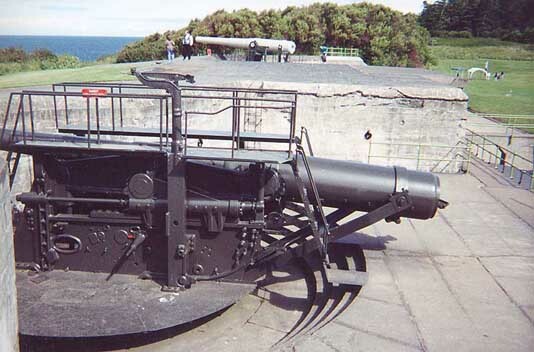 See the Fort Casey website by Gary Higgins, for more information on these guns. 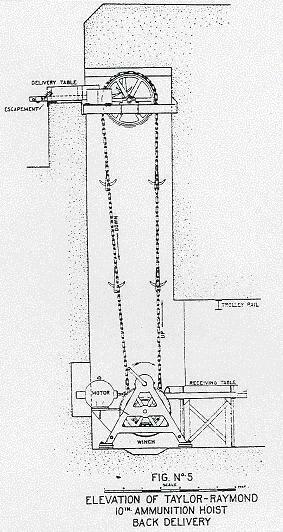 A diagram of a Hodges Ammunition Hoist. Battery Edward Chapin was completed in 1904, and named in honor of Brigadier General Edward P. Chapin, killed in action in Louisiana in 1863, and consisted of two 3-inch shielded rapid-fire guns, Model 1902, serials 37, 38 (Bethlehem Iron Co.), on pedestal-mount barbette carriages, Model 1902. The two-story wooden Secondary Mine Observation Station (M") was built in 1909 behind Battery Chapin, which complimented the primary mine station (M') at Fort Stark, which was later moved to a two-story wooden station at Fort Constitution. The mine stations were used to triangulate and plot the position of ships in the harbor mine field. All that remains today is the two-story concrete instrument pedestal base for the depression-position range-finding (DPF) instrument. A few other structures were also built during this time, including the 560-foot pier jutting out into the harbor (since rebuilt). 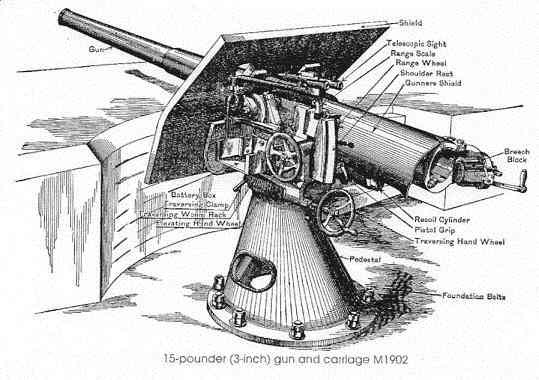 A diagram of a M1902 3-inch gun. 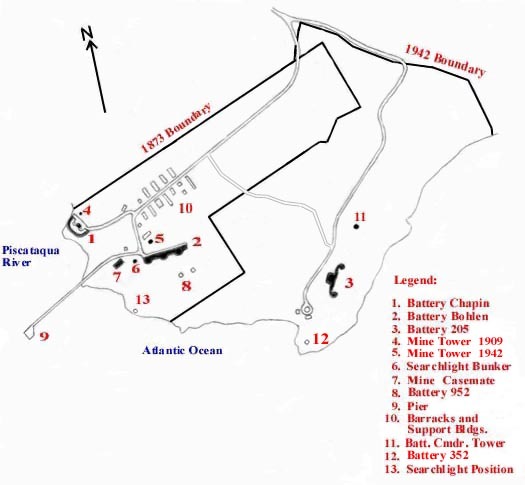 During 1905-07, the fort was officially garrisoned by the 124th Company, U.S. Coast Artillery Corps, but then afterwards, except during World War I (1917-19), was never actually manned by more than a caretaker unit, specifically Battery E, 8th Coast Artillery Regiment (Harbor Defense), U.S. Army, from Portland, Maine, until the onset of World War II. 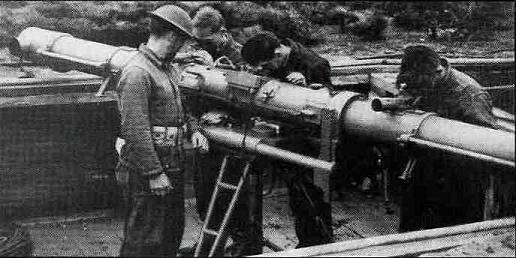 In 1917 all three guns of Battery Bohlen were removed for modification as railway guns for use in France, but they never went further than the Watertown Arsenal in Massachusetts. They were returned to Kittery and remounted in place in 1920. They were reported to have never worked right again, with the #3 gun completely unserviceable by 1940. Also in 1920, a Coincidence Range-Finder (CRF) station was built atop Battery Chapin. A height-finder instrument, very similar to a CRF instrument. Located at Fort Funston, San Francisco, CA. Two truck-mounted 60-inch Sperry searchlights were kept at the fort in 1920, to be emplaced at Seward's Point when needed (harbor positions #6 and #7), but were shipped to Fort Totten, NY in 1921. The searchlight shelter adjacent to Battery Bohlen was built in 1922, with a rail track to the shoreline for a rail-car mounted 60-inch Sperry light (position #5, later #12 in WWII). 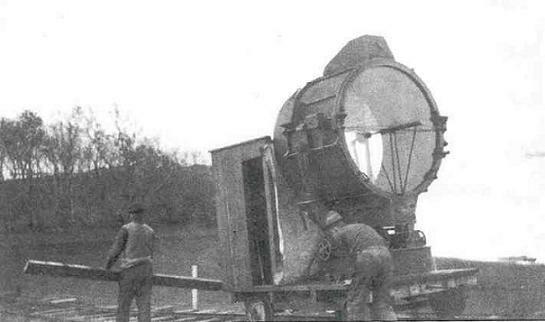 A 60-inch searchlight mounted on a rail-car, circa 1918. Located at East Point Military Reservation, Nahant, MA. 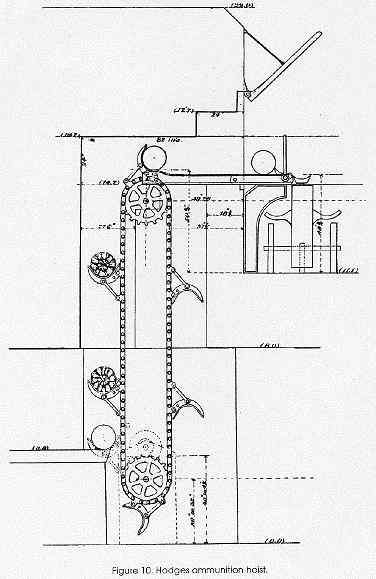 A diagram of a Taylor-Raymond Ammunition Hoist. 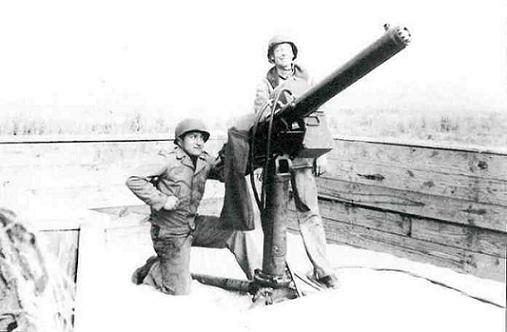 In 1940 the U.S. Army Fortifications Board recommended that a new battery, to be known as Battery Construction No. 205, should be built atop Battery Bohlen's #1 and #2 gun emplacements, but that idea was turned down in favor of emplacing it as an entirely new battery. In 1942 additional land, formerly the site of the old Pocahontas Hotel resort (1885 - 1904) which had been demolished in 1921, was purchased for the construction of the new battery. It was to have two shielded M1 6-inch guns on M4 barbette carriages, serials 9, 10 (Watertown Arsenal), nearly identical to those of Battery 204 at Fort Dearborn. However, although the battery was essentially completed in 1944 but without the gun tubes, it was decommissioned before the end of the war. The proposed name for this battery was to be Battery Curtis, in honor of Major Edwin S. Curtis). See The 6-inch Shield Gun by Andy Bennett of the Coast Defense Study Group, and also Sitka's 6-inch Gunsby Matt Hunter of the Coast Defense Study Group. Cutaway view of Battery 205. The gun carriages and shields were installed by 1944, but the two gun tubes were never delivered. Map based on 1945 U.S. Army Corps of Engineers site-map. The 22nd Coast Artillery Regiment (Harbor Defense), U.S. Army manned Fort Foster with 103 men from 1940 until 1942, when Battery Bohlen was decommissioned and scrapped. Anti-Motor Torpedo Boat (AMTB) Battery 952 was built in 1943 in front of Battery Bohlen, and used until 1946. It consisted of two shielded fixed-mount 90mm M1 guns, two mobile 90mm M1A1 guns (in storage at Fort Dearborn), and four .50-caliber heavy machine guns, which defended against possible commando raids. The wooden crib works for the motor torpedo boat defense can still be seen today at low tide between the fort and Wood Island. A picnic shelter has been built over the concrete block of the #1 90mm mount. AMTB Battery 352 was set up on the south point near Battery 205. It consisted of two 37mm mobile AA guns (later replaced with two 40mm M2 mobile AA guns), along with a dedicated searchlight. Two additional automatic 40mm M2 mobile AA guns and two .50-caliber heavy machine guns were emplaced around Battery 205 for land and air defense. The magazines in Battery Bohlen was used to store the ammunition for the AMTB batteries. located at Fort Monroe, Hampton, Virginia. 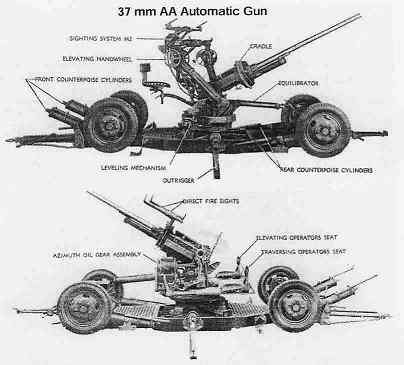 A diagram of a mobile 37mm AA gun. A drum-fed .50-cal. heavy machine-gun, used for AA and AMTB roles. Located at Sagamore Hill Military Reservation, Cape Cod Canal, MA., circa 1942. Fort Foster was closed in 1948, and every remaining weapon was removed and scrapped. The U.S. Navy then used the reservation for recreational purposes for Naval Shipyard personnel into the 1960s. The federal government later transferred the original area taken in 1873 to the Town of Kittery for park purposes, while the newer 1942 parcel was bought by Kittery at a later date. The entire park presently encompasses 88 acres. The Kittery Parks Division had the lower level of Battery Bohlen sealed and filled-in with soil in the late 1980s, along with sealing other structures. Battery Chapin's earthen berm was removed much earlier, probably by the Navy in the 1950s. Admission per person and/or vehicle is charged to enter to the park. Restrooms, picnic facilities, and swimming beaches are on grounds. There is no interpretation of the military structures, except for a simple flyer handed out during the summer to visitors upon entering. All buildings are closed to the public, except the ground-level of the Mine Observation Station, which is used as the park's public restroom (the upper level is sealed off). Official website of the Town of Kittery's Fort Foster Park policies and regulations. 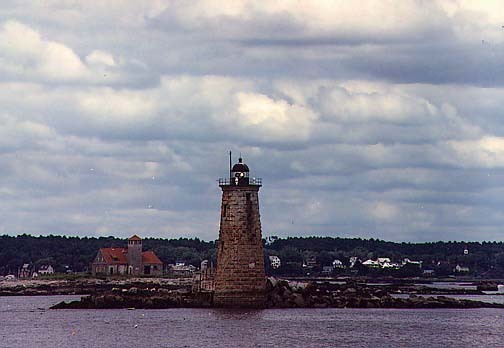 From various vantage points around the fort, especially on the pier, all of the harbor forts can be seen from here, as well as Whaleback Light (1872), and the old Portsmouth Harbor Lifesaving Station (1908-1966) located on Wood Island. Whaleback Light and the old Wood Island Lifesaving Station as seen by boat, opposite Fort Foster. See the Whaleback Light website by Jeremy D'Entremont. See the Wood Island Feasability Study - 2009 prepared by the Town of Kittery, University of New Hampshire, and Appledore Engineering, Inc., for more info. 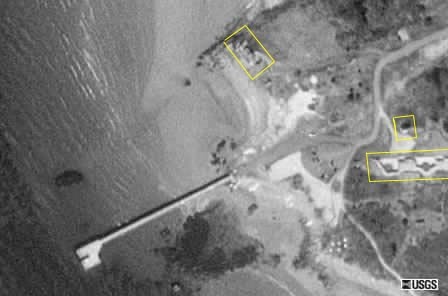 1992 USGS Satellite Images of the fort. 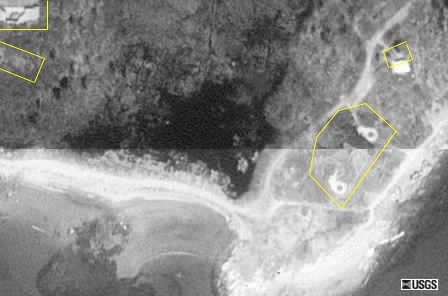 Batteries and other remaining structures outlined in yellow.